Born in 1928 and raised in poverty in Pennsylvania’s coal-mining country, Sheila Jordan began singing as a child and by her early teens was working in Detroit nightclubs, influenced by the music of Charlie Parker. After moving to New York in the early 50s, she married jazz pianist Duke Jordan, and studied with Lennie Tristano. 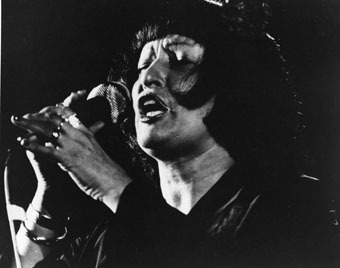 In the early 60s she made her first recordings on George Russell’s The Outer View which featured a famous 10-minute version of “You Are My Sunshine.” Sheila’s groundbreaking contributions to the history of vocal jazz include her numerous duo recordings with acoustic bass, including collaborations with Harvie Swartz and Cameron Brown. Today, at the age of 83, Sheila continues to travel the world singing, teaching and sharing the deep spirit and soul that is jazz. The evening, a benefit concert for The Jazzschool Institute Mark Murphy Vocal Scholarship, will feature appearances by Laurie Antonioli, Theo Bleckmann, Madeline Eastman, Kitty Margolis, Ed Reed and NEA Jazz Master Sheila Jordan. Our national treasure, Sheila Jordan is a woman who has touched souls for sixty years, and will surely touch all who attend on December 3rd. Come celebrate her 84th birthday at this historic concert. Purchase tickets ahead of time, as this event is expected to sell out.